In 2016, Degreed acquired Gibbon, a pioneer in developing software to curate and share learning resources from across the internet. Based outside Amsterdam, The Netherlands, it was our first big step expanding into Europe. But that was only the beginning. Almost three years into our European expansion, Gibbon has blossomed into a fast-growing product, engineering, customer support and sales office (and we’re still hiring!). We also have commercial teams on the ground in the UK, Switzerland and The Netherlands. Degreed now works in dozens of local languages, with a range of native European content sources already integrated. And we just opened a brand new data centre in Germany. All that focus, investment and effort seem to be working for our clients, too. Degreed’s European client base more than doubled over the last year, and we are closing in on 1 million licensed users all across the region – fast. 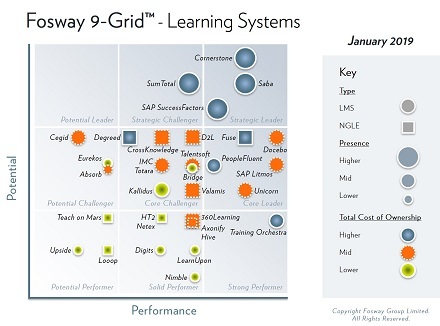 So we’re proud and excited that Fosway Group, Europe’s #1 HR industry analysts, just recognized Degreed’s product innovation and growing market presence in the 2019 Fosway 9-Grid™ for Learning Systems. This latest report advances Degreed’s position from a “Potential Challenger” to a “Core Challenger,” reflecting the strength and capabilities of our solution, our accelerating customer advocacy, and most importantly the impact we’re making for our clients. If you are interested in learning more about Degreed, please stop by our booth at Learning Technologies, Europe’s leading showcase for organisational learning technology, February 13th or 14th at ExCeL London. At the show, you can also hear how Photobox Group and Anglo American are working with Degreed to drive continuous improvement in their people’s skills. Or, join us at one of our upcoming Degreed Focus workshops in Paris or Amsterdam. You can access the 2019 Fosway 9-Grid™ for Learning Systems here.